NASA’s Juno spacecraft completed the first of 36 close orbital flybys of Jupiter last weekend after swinging around the planet in a highly elliptical orbit following the successful orbital insertion maneuver on July 4. 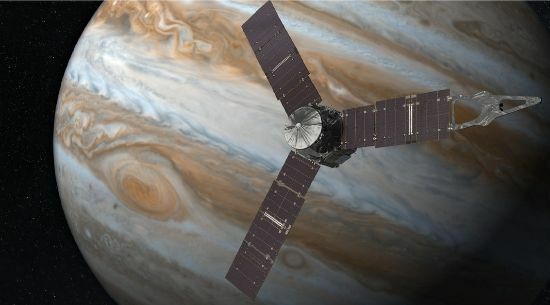 A journey of 1795 days and 2.6 billion Kilometers reached its destination back in July when the Juno spacecraft became the second to successfully enter an orbit around the Gas Giant for an unprecedented mission of exploration. Per the mission’s orbital design, the 35-minute orbital insertion burn placed the spacecraft into a highly elliptical orbit with a period of 53.5 days. 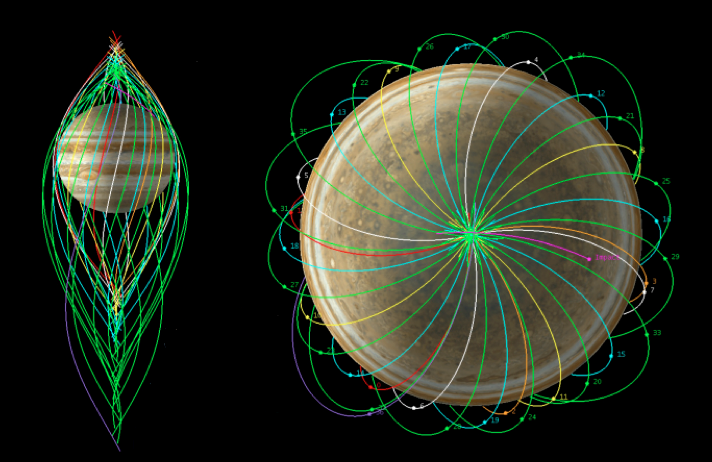 Juno completes a pair of these elongated orbits, known as Capture Orbits before spiraling down into its operational 14-day orbit in October. The reasoning behind this is to provide the mission team time to re-power Juno’s instruments and use the close pass after the first capture orbit as a full dress rehearsal of routine science observations as they will occur on the subsequent orbits. The JOI Burn put Juno into an orbit of approximately 4,200 by 8 million Kilometers and a series of operations were lined up for the first lap around the gas giant. A small clean-up maneuver on July 13 changed Juno’s speed by 4.9 meters per second to eliminate any trajectory errors after the 542m/s orbit insertion maneuver. An orbit trim maneuver slot was available on July 27 to precisely target the next low pass over Jupiter and Juno passed the high point of its orbit on July 31. Inbound again, Juno activated all instruments to complete the science sequence rehearsal on what is known as Perijove 1, the mission’s first orbital periapsis pass. Spinning once every thirty seconds, Juno was inbound from the north to pass over the north pole on a southerly heading to reach its lowest altitude near the equator, flying at a speed of over 200,000 Kilometers per hour. Closest approach occurred at 13:44 UTC on Saturday at an altitude of 4,200 Kilometers above the planet’s cloud tops. 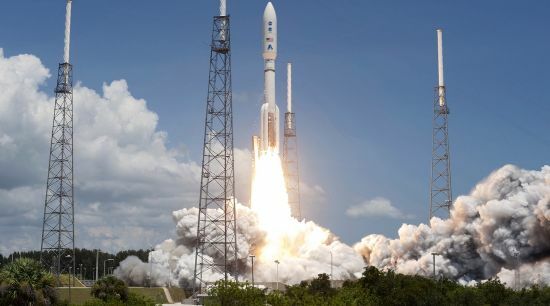 This marked the closest pass of the entire mission because the perijove altitude will step up with every subsequent orbit due to the need for trim maneuvers that are conducted on every orbit to target the longitude of the next low pass. 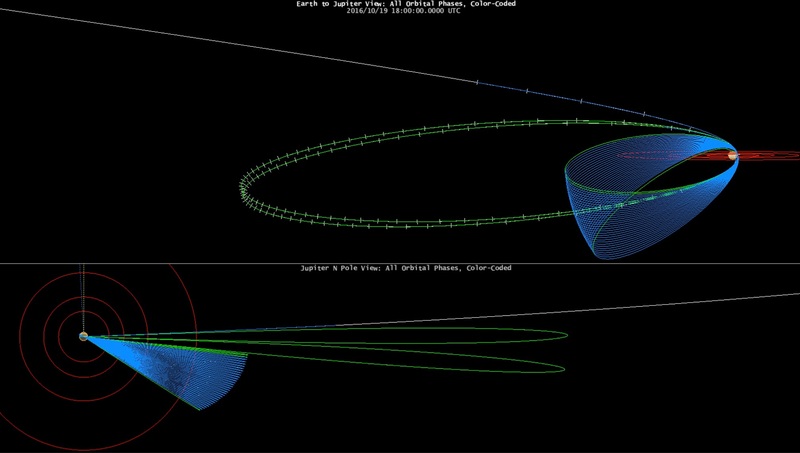 By the end of its 20-month exploration campaign, Juno will have an orbital low point of nearly 8,000 Kilometers. 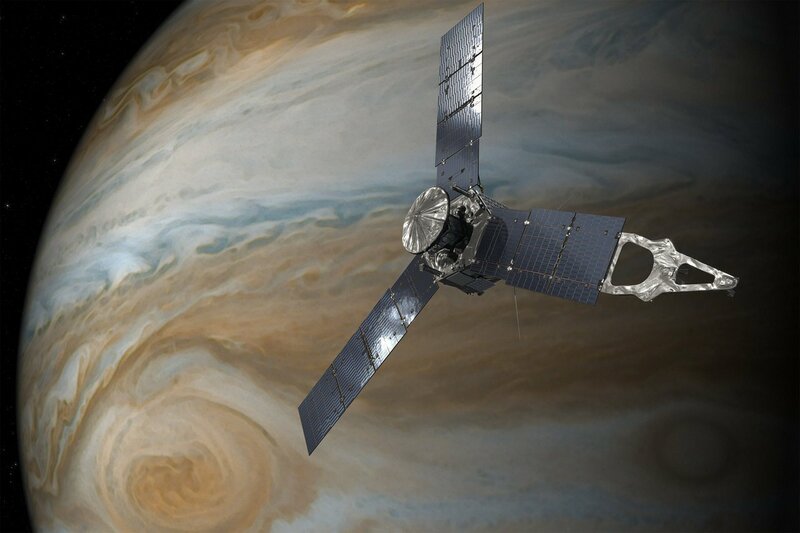 According to Juno’s mission team, Saturday’s flyby was a full success. 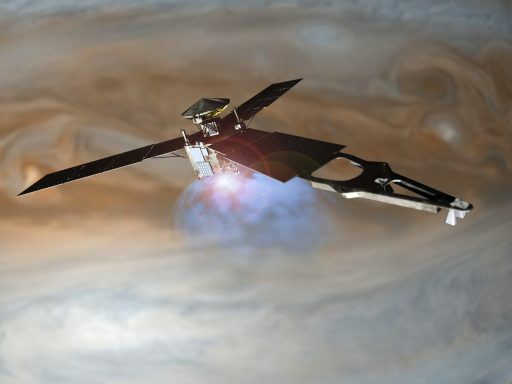 “Early post-flyby telemetry indicates that everything worked as planned and Juno is firing on all cylinders,” said Rick Nybakken, Juno project manager at NASA JPL. 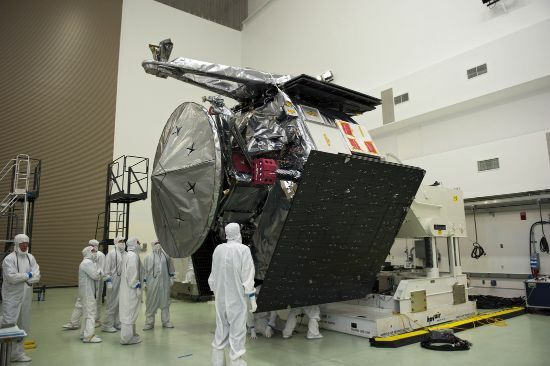 For Saturday’s perijove pass, Juno had activated its suite of spectrometers, radiometer, wave and particle detectors, magnetic sensor, and JunoCam, the mission’s educational payload and the only camera installed on the spacecraft covering the visible wavelengths. 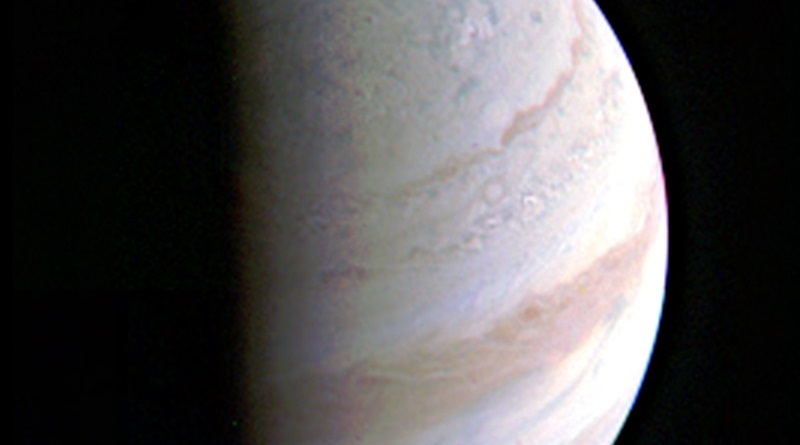 A JunoCam image released shortly after Saturday’s flyby shows Jupiter’s north polar region and the terminator where day meets night from a distance of 703,000 Kilometers. More images are expected to be released in the coming weeks, but data from the instruments is not expected in the near future as the science team gets their first look at what can be expected down the road when the full data set of 35 science orbits is available. 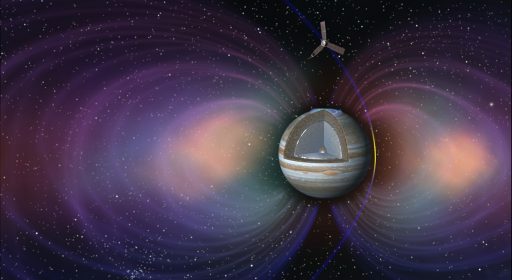 Juno gets an unprecedented look at Jupiter from a polar orbit – previous Jupiter flybys and the Galileo mission used equatorial trajectories to study Jupiter and its moons, but Juno focuses on the planet itself, enduring extreme radiation every time it dips into Jupiter’s intense radiation belts which are also a point of study for the mission. Now starting its second lap around Jupiter, expected to take 53.22 days, Juno is set to undergo a number of preparatory steps for its Period Reduction Maneuver that will place the spacecraft into a tighter orbit around the planet. Juno will again conduct an Orbit Trim Maneuver to set up the track for the Period Reduction Maneuver, to be performed around Perijove #2. Juno is expected to pass apojove on September 23, heading back in for the Period Reduction Maneuver (PRM) that will transition the spacecraft to its 14-day science orbit. Five days prior to the PRM, Juno will again switch off all instruments to avoid any instrument-related upsets impacting the operation of the spacecraft during the maneuver. Juno’s Period Reduction Maneuver is set for October 19 and, in its general architecture, will be very similar to the Jupiter Orbit Insertion Burn: Juno will point away from the sun and Earth, begin sending status tones, face its engine towards the direction of travel and fire to slow the spacecraft down. 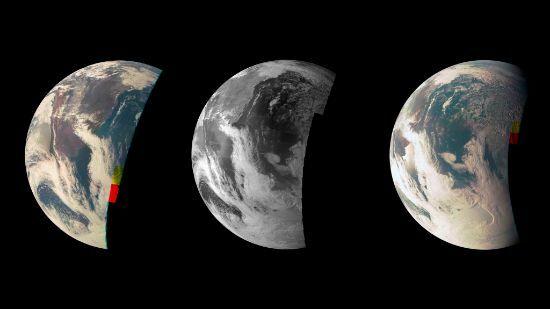 During the science mission lasting until February 2018, Juno will sound the Jovian atmosphere to peer deep below the planet’s dense cloud layers to regions where pressures reach the extreme and no telescope can see. Using six different microwave channels, Juno will examine the structure, movement and chemical composition of Jupiter’s atmosphere to over 500 Kilometers below the cloud tops, possibly revealing the mechanisms behind Jupiter’s colorful appearance as well as large-scale energy transport obscured by clouds. 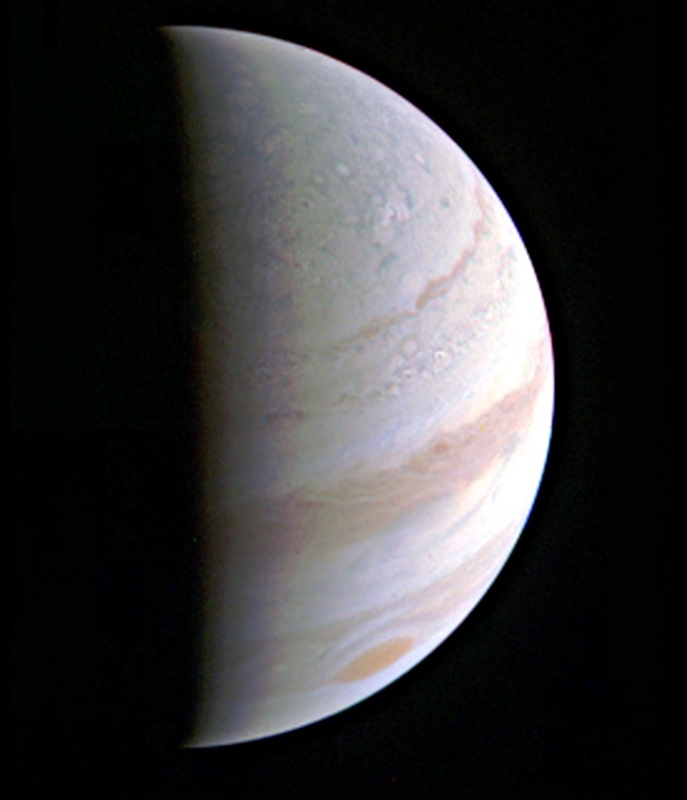 Looking below the cloud tops, Juno will be able to measure the abundance of a number of constituents including oxygen and hydrogen – a tracer allowing scientists to look back the formation mechanism of Jupiter early in the solar system’s history, taking a look into a distant past. Continuous radio tracking and turnaround ranging during Juno’s close passes will provide scientists with a look at Jupiter’s interior and reveal whether a solid core is present underneath the gaseous atmosphere – possibly one of the biggest mysteries hidden by Jupiter’s clouds. A magnetometer unit installed on a boom attached to one of the three solar arrays along with a plasma wave sensor will deliver a three-dimensional map of Jupiter’s powerful magnetic field while a pair of Energetic Particle Instruments studies the inflow of charged particles and their interaction with Jupiter’s magnetic field that funnels particles toward the atmosphere to create the most powerful auroras in the Solar System. Juno is also outfitted with an Ultraviolet Spectrograph, capable of measuring the spectrum of the Jovian aurora to help characterize the sources of Jupiter’s powerful auroras. On the opposite side of the spectrum, Juno’s Infrared Auroral Mapper will deliver complementary measurements for studies of the aurora and atmosphere.